In a world where people are always on the move, working hard and exercising, the chances are that many of them will suffer from spine or back pain. That may be part of why so many are now buying inversion tables. Inversion tables are a great way to implement inversion therapy. This technique allows anyone to carry out inversion therapy to alleviate back pain. During this process, a person will be stretched out and suspended in an upside down position. That allows them to stretch the spine as a means of achieving alleviation. Before you decide to spend money on an inversion table, you need to know if they are worth the money. Secondly and most importantly, do they work? First of all, inversion tables use gravity to help take some of the pressure off your spine. That is how they are designed since a person’s spine, over time, becomes compressed. By allowing a person to be hanged at an angle or upside down, the theory of an inversion table goes to work. In this position, an individual’s head ends up being lower than their feet. In turn, that helps to take off added pressure to one’s back. Also, the spine will be decompressed as you hang in this position. Keep in mind that those who suffer from health problems should speak to a doctor before using one. According to several studies, inversion tables provide benefits for several issues. The most important one is helping with general back pain. There is also joint pressure relief which people get from workouts or other high impact activities. Inversion tables also help with the organs and blood circulation. Being upside down or using gravity, is something that affects all of the organs in a human body. Others also find that using an inversion table will allow them to maintain their height. That’s because on average, a person will shrink about 3/4 inches daily. Based on these factors, the benefits of using an excellent inversion table are apparent. Now that people are looking to purchase a top-rated inversion table, a large number of manufacturers are offering them on the market. But, with so many to choose from, finding the best inversion table can be difficult. Before you decide to buy one, there are several things you need to consider. The compilation below contains the top 5 best inversion tables available. These are not only great for inversion therapy, but also other issues. This list takes into consideration factors which are extremely important. Determinants such as pricing, user ratings, reviews, performance, durability, features, and many others, have been used to rate them. Anyone looking for a heavy duty inversion table should feast their eyes on the Innova ITX9600 Heavy Duty Inversion Table with Adjustable Headrest & Protective Cover. The backrest is very large when compared to other similar inversion tables. It has the right balance system which makes it very useful. This comes in handy since there is a center of gravity that is unique for every person out there. Besides the innovative balance system, the six angle pin system is another reason the Innova ITX9600 is worth considering. It is ideal for whenever a person wants to consistently, quickly and safely achieve the best inversion possible. With an adjustable headrest pad, the Innova ITX9600 Heavy Duty Inversion Table with Adjustable Headrest & Protective Cover appears to be quite comfortable. When it comes to features found on an inversion table, the Innova ITX9600 Heavy Duty Inversion Table has several to make it stand out. Besides being aesthetically pleasing, it is also very sturdy and well made. Most inversion tables typically come with only one or two parts which are adjustable. The right balance system found on the Innova ITX9600 has three of them. That allows users to see the most comfortable position with ease. 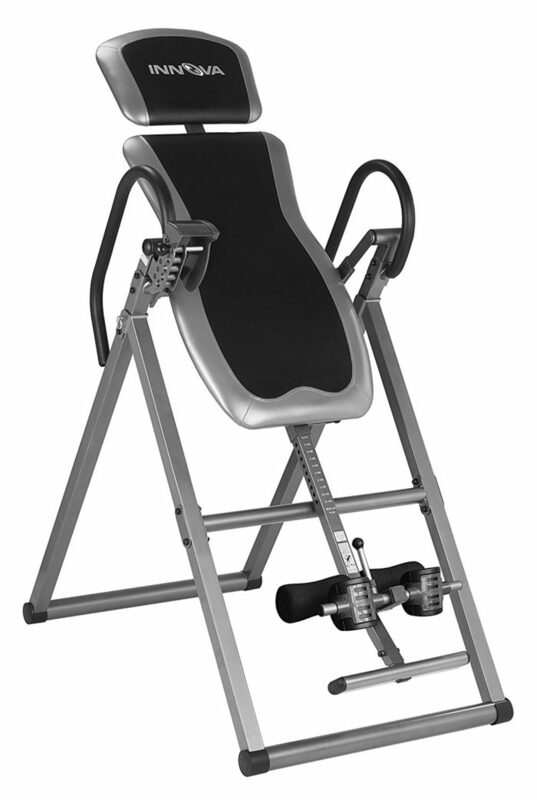 The foot, headrest pad, and height on the inversion table can be adjusted via these features. Another useful feature on the ITX9600 inversion table is the six angle pin system. That helps keep anyone on it more comfortable and secure. Able to accommodate individuals in a wide range of sizes. Anyone from 4ft-10in to 6ft-6 inches. Has a weight capacity of 300 pounds. A patent-pending protective cover and six (6) pin position adjustable pin system. Very useful for allowing anyone to invert quicker and safer. Padded backrest which is very comfortable, adjustable and large. An ankle holding system that is reversible and ergonomic achieved via the right balance system. Easy and quick inverting attained. Well made heavy duty steel frame. It’s aesthetically pleasing with its gray and black color. The height adjustment tube lets people of all sizes find the right accommodation according to their size, weight, and height. The unit is foldable making it easier to store. Backrest which is extremely comfortable, large and padded. Foam handlebars are soft which allow a better grip that’s more comfortable. Takes some getting used to when trying inversion tables for the first time. No straps for keeping legs or feet together. Plastic cuffs on the front tend to dig into your foot. Taking the pricing, features, and reviews into account, makes recommending the Innova ITX9600 very easy. Aside from the heavy-duty steel frame, you also have how beautiful it looks. The right balance system is also something that one must not ignore since it is essential when it comes to inverting. The pros found on the ITX9600 also made this unit stand out among others. And the cons were relatively minor compared to other inversion tables on the market. Overall, anyone looking for an excellent inversion table should think about buying the Innova ITX9600. One of the things which helps tell the story about a top-rated inversion table are the customer reviews. We found most of them to be very confident with many recommending the ITX9600. A customer name John wrote “A real life changer for me. Ten stars.” We also found another verified purchaser who simply stated “Sturdy & Affordable” in his review of the Innova ITX9600 inversion table. In her testimonial, a lady named Mabeyta wrote that “I would HIGHLY recommend this product to anyone who has back problems” when speaking about her experience. 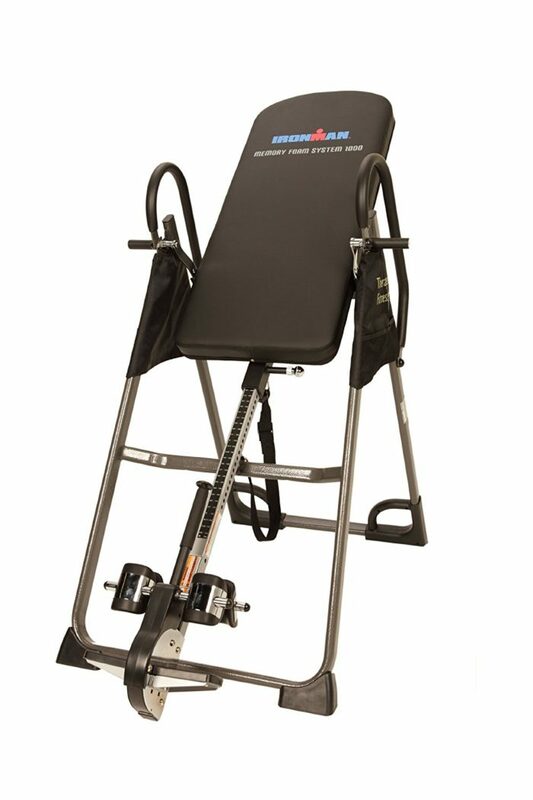 Individuals who are looking for a perfect inversion table, need to keep the IRONMAN Gravity 4000 Highest Weight Capacity Inversion Table in mind. This inversion table is ideal for helping anyone who wants to stimulate their blood circulation. The same for those who wish to help with reducing their back stress. The steel frame on the IRONMAN Gravity 4000 is quite sturdy. It also has a powder coated finish and a memory foam nylon backrest. The rubber non-skid floor stabilizers are tough and render added stability. Right out of the box, the IRONMAN Gravity 4000 comes well packaged for extra safety during delivery. The directions are easy to follow and make assembly very effortless. The easy reach “Palm Activated” patented feature comes in handy. It allows you to adjust the ratchet ankle locking mechanism on the inversion table. The PVC equipment mat is waterproof and foldable. That is very useful for anyone who wants to reduce noises and avoid damaging their floors while on it. Users can also take advantage of the extra extended safety handles on the IRONMAN. They allow anyone to go back to the upright position in no time. The ankles can be held back securely and comfortably with the ergonomically ankle cushions it has. Able to support individuals up to 350 pounds. Height adjustments go up as much as 6’6 inch. Powder-coated finish and tubular steel frame for durability. PVC equipment mat provided which is waterproof and foldable. The ankle cushions are ergonomically molded and hold your ankles comfortably and securely. Easy to use palm activated adjusting ratchet locking system for your ankles. Folds easily and quickly for easy storage. Stable and comfortable inverting capability. Tough rubber stabilizers are non-skid. Extremely handy when inverting. Safety handles on the unit are extra-long. Allow anyone to return to the upright position with ease. High quality teeters unit and leg clamp system work very well. A bit pricier than other inversion tables. Some find a unit to be too small for their size. Takes up some space for those who don’t have much to spare. Individuals who have space for it will have no problem with the IRONMAN Gravity 4000 inversion table. In all, it is one of the best inversion tables on the market. That is based on the high number of positive reviews it has already received. Being able to withstand up to 350 pounds and as much as 6’6′ inch in height is also impressive. So are the ankle cushions and palm activated ratchet ankle locking system? The only setback for some may be the price. It is a bit higher in cost than most other units out there. However, the strong inversion, durability, ease of use and benefits it renders, make it worth it to the right person. Finding great testimonials previous customers of the IRONMAN Gravity 4000 wrote about it was very easy. 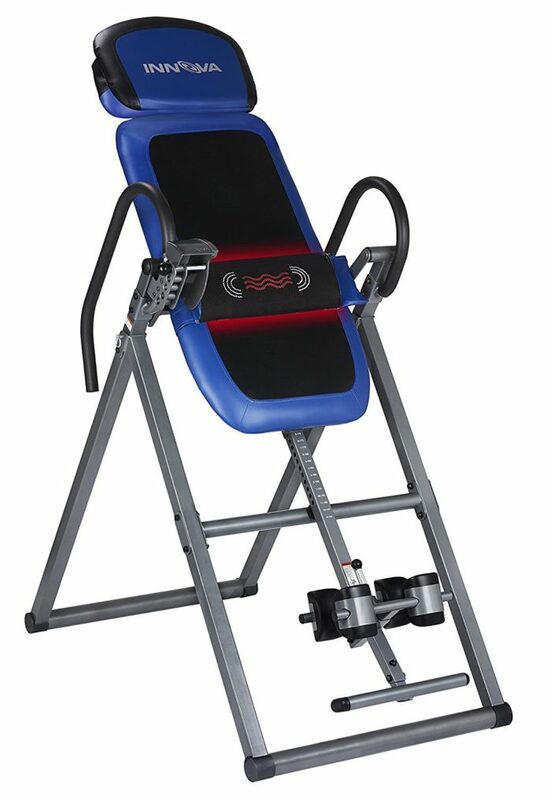 That’s because it has some of the highest ratings of any top-rated inversion table presently on the market. A user by the name of TobycW said “solid build, great price, works super!” when recommending the IRONMAN. A person who called himself Esulivant wrote that the IRONMAN Gravity 4000 was worth because of its “Great price, very sturdy, great results!.” Then there was the comment from Doo Dah Man. His review is quite impressive since it took place after using the inversion table for more than seven weeks. He wrote “if you’re thinking about buying this, do it now (updated after seven weeks)” on his review. Those looking to relax their bodies, diminish fatigue, improve their back stress and blood circulation will appreciate the Exerpeutic Inversion Table with Comfort Foam Backrest. To be able to handle people of most sizes, the Exerpeutic is capable of withstanding a total weight capacity of 300 pounds. It also adjusts to individuals ranging in heights as small as 4 ft. 10 inches and as tall as 6 ft. 6 inches. To ensure stability whenever a person is inverted, the Exerpeutic is made out of heavy duty steel frame consisting of 1.5-inch thickness. The backrest on the Exerpeutic Inversion table provides comfort since it is made with .75-inch foam. To hold your ankles safely and securely, the foam rollers and ankle cushions have an adjustable tether strap with a secure pin release. The highly rated inversion table weighs 55 pounds and has 50 x 25.5 x 56 inches dimensions. Aesthetically, the burgundy color backrest and steel plated frame are pleasing to the eyes. The unit is quite sturdy and capable of handling inversion with ease and comfort. Most experts agree that inverting your body may help reduce pressure on ligaments and vertebrae. This is where the Exerpeutic Inversion Table delivers since the extra long handlebars, and comfortable backrest allows inversion easily and quickly. Steel frame made out of heavy duty material. Vertical position inversion all the way up to 180 degrees. Easy to use pull pin release system. Adjustable tether strap for ease of use and safety. Lets users return to the upright position in no time. Maximum 300 pounds weight capacity. Can adjust heights ranging from 4 feet, 10 inches to 6 feet, 6 inches tall. Ankle locking system provides security and safety. Handlebars are extra long and have a full loop safety design for added sturdiness and security. Able to allow inverting in a few simple steps while allowing a return to the upright position quickly as well. Foam rollers and the ankle cushions render comfort. The secure pull release system is beneficial. Folds away neatly to save space once you are done using it. The instruction manual is very thin. Could use better instructions. Does not fit under most beds when folded. May need to be stored elsewhere. Takes some getting used to using when inverting. The pricing on this unit is right in between which makes it a very cost-effective purchase. The practical features allow a person to invert their bodies with ease and quickness. It does take some getting used to at first. But, this is typical when it comes to most inversion tables and hanging upside down. The weight capacity and height adjustability are enough to accommodate most people. Many of those who bought the Exerpeutic Inversion Table seemed to be quite pleased with the heavy duty steel frame. The same for how comfortable and sturdy it was while they were inverted. Also, this unit had a large number of positive reviews making it one of the best inversion tables you can buy. Being able to read reviews from those who have already purchased an inversion table is very helpful. They play a significant role in showing what you can expect from it. Based on the testimonials found, the Exerpeutic Inversion table appears to be a great buy. A person by the name of Ryan summarized his review by saying “I can walk again! Well, I could before, but bending over hurt until now!” To help others see what this inversion table has done for him, a verified purchaser wrote “My back pain is gone” when lauding this unit. You also had someone else state “More than I expected” as she spoke about her experience with the Exerpeutic. Featuring many new characteristics, The Innova ITM4800 Advanced Heat and Massage Therapeutic Inversion Table have many which make it stand out above others. The unit has handlebars which are soft and very comfortable to use. The backrest on the Innova ITM4800 also renders comfort since it is vast and cushioned. Anyone who purchases the Innova ITM4800 Heat and Massage Therapeutic Inversion Table will have a lot to look forward to. The sturdy and secure heavy duty steel frame requires some assembly. However, it doesn’t take that long since the instructions are not that hard to follow. Once you are done, you will get a comfortable and big backrest pad. It also comes with a headrest pad that is adjustable for your size and preference. The ankle holding system is easy to use and ergonomic. To make your inversion experience more comfortable, the unit has the right balance system. Unlike other similar inversion tables, the Innova has an adjustable massage pad. That in itself is enough to set it apart from most of the other inversion tables on the market. Capable of accommodating individuals in size ranging from 4ft- 10 inches to as high as 6ft 6inches. Total maximum weight capacity of 300 lbs. One year warranty to provide ease of mind. It’s imposing six (6) pin adjustable position system. Vibration therapeutic massage and isolated heat inversion capable. Feels safe and secure since the frame is made out of high-quality steel. Massage lumbar pad and horizontal heat features make it, unlike other inversion tables. Triple adjustment structure from the right balance system renders greater inversion results. Cost much less than other units which have far fewer features. Does not have a locking feature when folded which makes it harder to store. Ankle brace can become uncomfortable when inverting for long periods. Assembly can be difficult for novices. Most of those who purchase the Innova ITM4800 Advanced Heat and Massage Therapeutic Inversion Table was very impressed with the results they attained. Besides being able to invert with ease, they also praised the inversion table for its many features. The massage, isolated heat and vibration characteristic make it, unlike most inversion tables you will find today. With a one-year warranty and a high amount of positive reviews, this is a very worthy candidate for those looking to purchase a good inversion table. The pricing, durability and other features also make an evaluation of this unit easier when it comes to recommending it. You will find no shortage of users praising the Innova ITM4800 inversion table. A lady named Vivian made that clear on her review as she quipped “I should have bought this years ago.” Another person who has been verified as purchasing this unit said “Best Inversion Table Ever” when referring to the Innova ITM4800 Advanced Heat and Massage Therapeutic inversion table. Those wondering about the massage feature will appreciate the review by someone named Joanna. She writes “Worked perfectly…heat/massage is great!” when telling her story about this unit. The tubular steel frame with which the IRONMAN High Capacity Gravity 3000 Inversion Table, 350 lbs unit is built speaks volumes. Combined with the large backrest and extra long safety handles, it’s one made for individuals who want an inversion table which is capable of handling more prominent people than usual. The IRONMAN high capacity is also capable of adjusting to users as high as 6 ft, 6 inches. All of those features spell out relief for people looking to reduce back strain and stress. As well as those who may want to increase their blood flow. The 2.5″ backrest is among the largest of any other inversion table on this review compilation. The 350 lbs weight capacity is also another feature pinpointing to how much the inversion table can take. Still, you will need a sturdy and well made tubular steel frame to make it all work. That is precisely what the IRONMAN delivers though. Besides, there is a powder coated finish that makes it scratch resistant. Add the 1-year limited warranty and high-quality materials used as well to the list. At 87 pounds, it does weigh a bit more than other inversion tables. But, it is not by much since most average only a few pounds less. For more comfortable and sturdy inversion, the safety handles are extra-long. The handle grips also let anyone exercise and invert their bodies much easier and faster. Double stitching on the 2.5″ backrest for durability. Able to support individuals of up to 350 pounds. Ratchet angel locking system which is patented. More comprehensive than most tubular steel frame for added support. Folds away to make putting in storage easier. Handle grips which are invertible. Scratch resistant powder coat finish makes it stronger and adds years to its life shelf. Ankle holders are ergonomically molded for comfort. Backrest has memory foam to make inversion cozier. A big bigger than other inversion tables. Since it weighs more than 80 pounds, you may need two people to assemble it. It’s priced a bit higher when compared to other inversion tables. 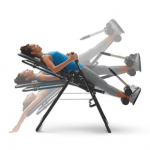 A large amount of the people who have already bought the IRONMAN Capacity Gravity Inversion Table rave about it. They say how well-made and sturdy it is when they invert their bodies. The unit is a bit bigger in size and weight than most. But, that is because it is designed to withstand at least 50 pounds more than most average inversion tables. 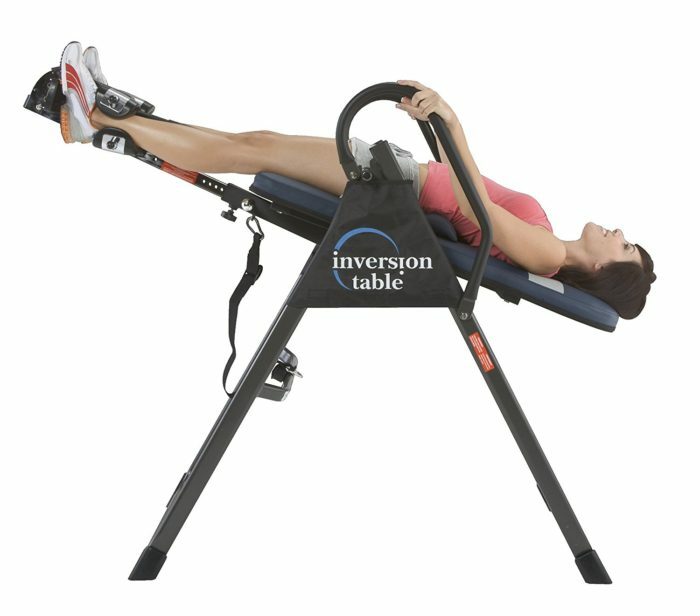 You may have to pay about $60.00 or more for this inversion table when compared to others. However, that higher price is based on the features and capability to handle more weight. 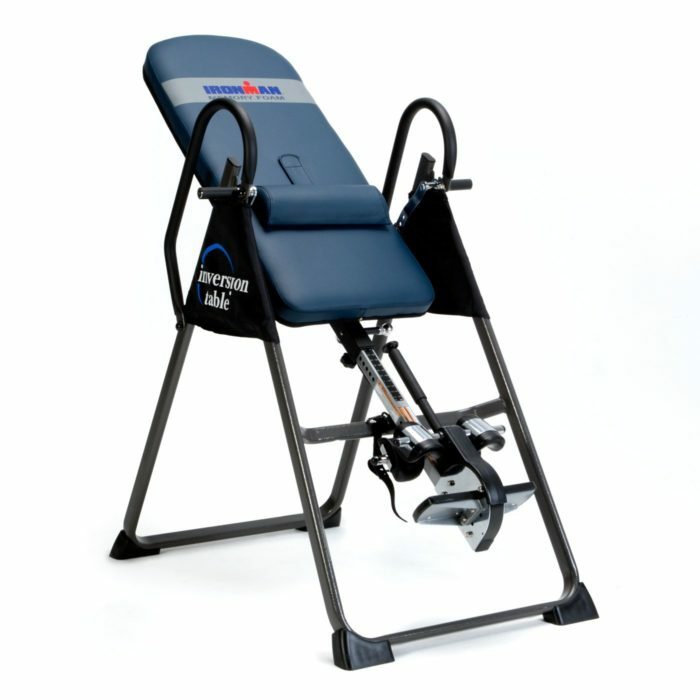 Overall, the IRONMAN Capacity Gravity Inversion Table is a great buy. It has earned a place in this compilation of the best inversion tables on the market for a reason. When considering which inversion table to buy, the number of positive reviews this unit received make it a lot easier to purchase. We found a large amount regarding the IRONMAN High Capacity Gravity 3000 Inversion Table. Using one word, a person wrote “Excellent” when commenting about her experience with this unit. As if to help others make up their minds much faster, a person by the name of BC wrote “Great machine for the price” in regards to how he felt about the IRONMAN. Still, the testimonial from DJT says it all. He wrote, “I only got this yesterday, but I would say this is one of the greatest inventions I have encountered.” That review, as wells as others, leave a great impression about the IRONMAN Capacity Gravity Inversion Table. Deciding on a purchase is always a difficult thing to do. Especially when there are so many different brands, models and styles to choose from. Still, all of the tops of the line inversion tables on this list have earned their spot. In their way, they each deliver something for the right individual. 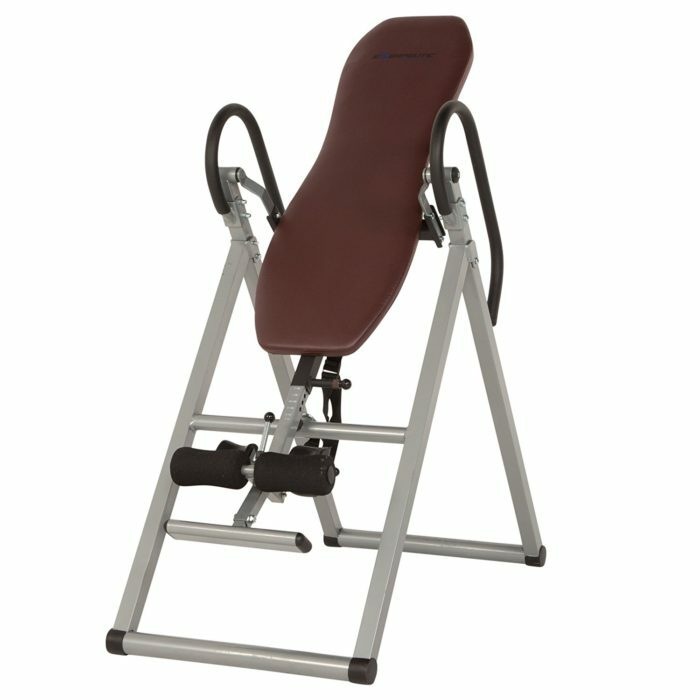 If you are one of those who needs an excellent inversion table for inversion therapy these are all worth considering. Just keep in mind that it may take some getting used to at the beginning. More so if you have never really done inversion therapy before. In the end, if you have back problems, need to reduce back stress and increase blood circulation, then one of these will do the job for you.